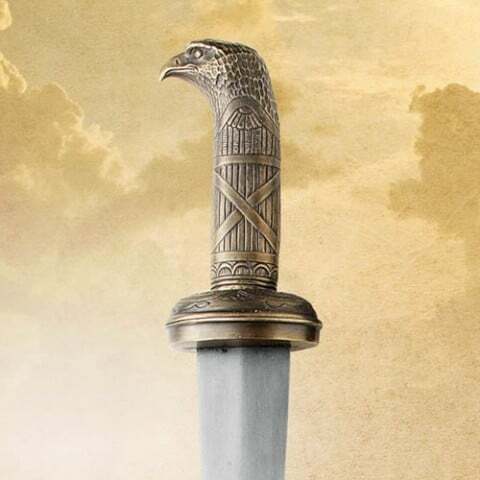 Another of four swords selected from the Roman epic The Eagle. Incredible gladius truly worthy of any Roman officer. Meticuluosly reproduced from the actual prop used in the film. Custom 51cm blade made from hand forged tempered high carbon steel. All parts are highly detailed and hand finished in antiqued solid metal. Overall length 68.5cm. Weight 0.8kg. Leather wrapped wood scabbard is accentuated with real metal detail with Baldric. Includes full colour Certificate of Authenticity. Can be factory sharpened for an additional $25. Find a belt for your sword.